Naturally, since Sew What? is a U.S. company, the majority of our customers are also in the U.S. We make soft goods for schools and churches, theatres and special event companies all across the country. But did you know that our custom stage curtains, digitally printed backdrops, and theatrical supplies can be seen across the globe? As you know, we have provided soft goods to the tours of a number of well-known recording artists. In many cases, those goods are used not only for the North American portion of the tour (including Canada), but on other continents as well. In some cases, we even make custom drapery specifically for the European leg of the tour, such as with the mixed media cut drop we made for Lady Gaga. What I find particularly exciting, however, is when we are discovered by a production designer in another country. One example is Peter Young, the well-known European music producer, designer and drummer. A few years ago, Peter (also known as Takis Kouvatseas) was producing and designing the European tour of Greek / Cypriot pop star Anna Vissi and was looking for just the right soft goods company. He discovered Sew What? through our website, contacted us, and the next thing we knew, we were turning his vision into reality. Since then, we have worked with Peter to provide drapery for several other projects, primarily in Greece. 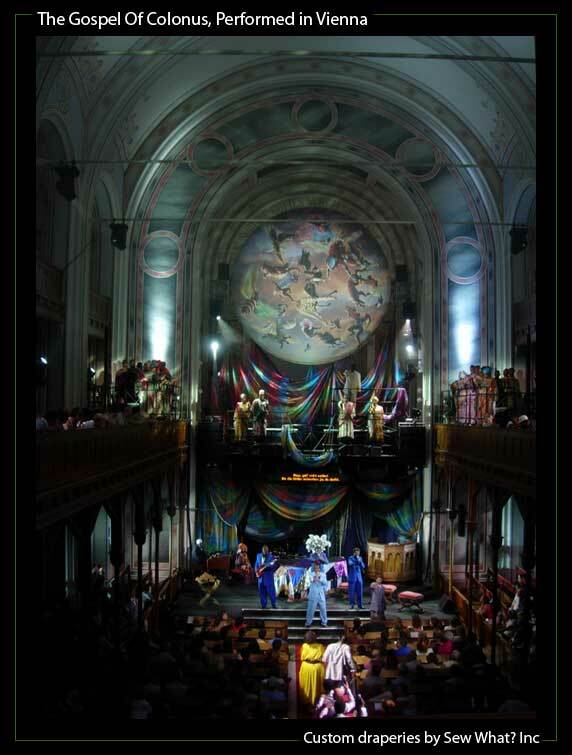 Another exciting international project that we did was for the production of “The Gospel at Colonus” at the 2006 Vienna Music Festival. This project included colored voiles, crushed satin, and buillion trim and rope to create a multi-layered effect. To me, the showstopper was the gorgeous digitally printed medallion that we created using designer Alison Yerxa’s beautiful artwork – just incredible! And it’s exciting to find that we are recognized in the news as a “player” in the international market. U.S. News and World Report included an article on us in their July 31, 2006, issue, in which they called Sew What? a “global brand,” and we even got a mention in Denmark’s “Backstage” magazine (in Danish, of course). When I think about it, though, it really isn’t all that surprising that Sew What? has “gone international.” While we may be based in the United States, the reality is that we really are a global company. After all, Megan (company founder and president) immigrated to the U.S. from Australia, Adam (CFO) came from New Zealand, and many of our staff are immigrants from Mexico and Latin America. We really are a melting pot – and so I think that gives us a greater ability to expand our focus beyond the U.S. border and out into the world. Recently we did a fun project for Mariah Carey, for her four-show gig in September and October at the Palms Casino in Las Vegas. The designer came to us with a unique mixed media concept – an ethereal floral drape evoking cherry blossoms in the garden. It sounded challenging, but we knew we could pull it off. We started with clear vinyl. After printing the vinyl with a series of different colored dots, we cut the vinyl into narrow strips, in lengths ranging from 9′ high to 20′ high. Then, using hundreds of white silk flowers, our crew meticulously attached the flowers onto the vinyl strips, with larger and smaller flowers attached just so. What seemed like random placement was actually well thought out – those printed color dots determined flower placement, with each color indicating which flower size was to be attached in each location on the vinyl strips. To add to the look, we digitally printed 30 butterflies onto clear vinyl, cut them out, and attached them “randomly” on the vinyl strips, as if butterflies were flitting from flower to flower. Webbing headers were used to turn layers of these flower & butterfly strips into drapes, with a layer of sheer stretch net fabric added strategically to some of the sections for a diffused look. Our sister company, Rent What?, also provided a stunning element to the show, with gorgeous swags and legs from their Silver Satin Series. I think it turned out beautiful. Want to see the finished look? Check this video of one of the September shows. I was surfing the Internet recently – a late night habit I have developed – and struck upon some travel commentary. It reminded me just how much I love to travel – and in turn got me thinking about all the amazing travel opportunities I have had which have been work related. International and domestic – I admit to having had a pretty good run of it. GREECE – yes- you heard correctly – 14 days in fact on board a luxury cruise liner visiting Mediterranean locations as exotic as Santorini and Venice, even stopping in Corfu just in time for the breaking of the pottery urns at Easter time. I was not sewing stage draperies at the time – rather was a project coordinator for a privately chartered sales incentive program – back in 1993 or so when there were budgets for such extravaganzas. These days they don’t go to Greece – they just serve Feta on the salad in an attempt to give some international flair. NEW YORK CITY – the Big Apple – a product launch. As a selected speaker for the launch of the Dell Computer Vostro computer lineup, I had the pleasure of visiting the top floor of the Reuters building and seeing our company posted on the LED billboard in Times Square. Amazing! BARCELONA – the Olympic Stadium was new, just post-Olympics, and then there was the trip to the convent on a Sunday to take fresh eggs to the nuns – a village tradition. This time in charge of a large drapery installation amongst other elements for a privately sponsored event, this work trip left me with memories of La Segrada Familia and a fond appreciation for all things Gaudi. CANCUN – Oh my – building a tent on the beach in the middle of college spring break. Is it OK if I try to forget this “gig” memory? Thanks. I think we should let it go quietly. TURKEY – I departed a cruise ship in Kusadasi after 5 days on board. This time doing a large upholstery project singlehandedly – it was a work-all-night-and-sleep-all-day kind of scenario. No matter, however – with the time difference between there and America, it was easy to work the schedule. I covered several hundred running feet of ducting with flame retardant Sunbrella® brand fabric – hard work but rewarding. NEW ORLEANS – there were hurricanes – lots of them. And I am not talking about wind and rain. WOW – New Orleans is a really hard city to stay focused in when it comes to deciding whether to work…or eat crocodile. BRUSSELS – Not sewing concert curtains – but SPEAKING! Yes – I was invited to speak in Brussels at an IFAI conference, on the subject of wide format digital printing. This was a terrific experience where I met some very educated people on the subjects of “smart” and “intelligent” textiles. So – my point here, I think, is that I have been fortunate indeed – to have been invited to work on high profile projects, in interesting places. My grandparents and parents alike loved to travel – Adam and I have the bug too – so I picked the right profession, you might say. Next……the stars? Oh no – I am already reaching for them. While we make custom stage curtains, scrims, backdrops, etc., for many of the biggest music tours around (who employ some amazing lighting designers and techs), we also provide soft goods to people at small schools and churches who may have limited knowledge of stage lighting. For those folks, I thought I’d list some resources on the subject that we find especially helpful or interesting. OnStageLighting: A terrific site from the UK with a variety of articles on stage lighting techniques, equipment, etc. It is described as a blog, but if so, this is the most comprehensive blog I have ever seen! There is a very extensive list of articles & tutorials on a wide variety of lighting-related topics. Professional Lighting & Production Magazine: This is the website of a Canadian print magazine. It is a little cumbersome to read the articles (you have to open up a special online edition of the printed magazine and flip the digital pages as you read), but there are some good articles to be found if you persevere. The bookstore and resources links are also helpful (Note: if you are in the US, you might want to browse the books and then try searching for them on Amazon or through another US bookstore). PLSN Projection, Lights and Staging News: This is the website of one of the two major lighting and staging magazines in the US. All articles in the current issue are online in an easily-accessible webpage format, online archives, and prior issues in PDF. Plus there are extras such as a job posting page, Tips and Tricks and more. Live Design: This is the website of the other major magazine in the US devoted to the subject of lighting, sound, and staging. Lots of good information on the site, well-organized according to production type (such as theatre, concerts, etc.) and with a good archive of online articles from prior issues. A big congratulations to Megan Duckett, President of Sew What?, for being named a finalist for a 2009 Stevie Award for Woman in Business in the “Best Entrepreneur – Service Businesses – Up to 100 Employees – Other Industries” category. The 2009 winners will be announced on November 13th – keep your fingers crossed for Megan!